Imagine: a dark and gloomy night, lit only by the pale glow of the moon, the cold twinkling of distant constellations, and, perhaps, a few flickering jack-o’-lanterns. A bighting breeze nips against your jacket as your pace and heartbeat quickens. Pushing deeper into darkness, the only sounds you hear are the steady crunching of leaves underfoot and the occasional baleful cry of Auburn’s murder of crows. From somewhere in the brisk autumn air, wafts the faint smell of a far-off burning fire. And then at last you arrive at your destination, the imposing stone gatehouse of Fort Hill Cemetery. Taken together, this scene can only mean one thing— Haunted History season is here again. The streets of Auburn, lined with historic houses and iconic buildings, look so different under the cover of night. What is comforting and familiar about these places by daylight becomes eerie and disquieting after sundown, almost as if the secret histories concealed within only come alive in shadows. As Halloween approaches and even more things go bump in the night, you are invited (nay, dared) to join the Haunted History tours led by guides of the Seward House Museum. This popular Auburn tradition is back and more frightening than ever with a new batch of spine-tingling and ghostly tales drawn directly from history. Those brave enough to attend will be told the blood-curdling story of John Colt, sentenced to die for committing a grisly murder while William Seward was Governor of New York. The shocking, horrifying mystery surrounding his ultimate fate is stranger—and more disturbing—than any fiction, and it rocked the Seward family. Tour-goers will also learn how death stalked Auburn during the 19th-century, touching the Sewards’ more than most. Little wonder, truly, that so many Victorian Auburnians began to embrace strange new funeral rites or even attempted to commune with the “unquiet dead” through spirit rappings and séances. Indeed, the haunted underside of history will chill visitors, getting them in the spirit for Halloween. But it will also offer frightening insight into the dark side of Auburn’s past. Walk back in time with guides from the Seward House Museum, and discover which ghosts from Auburn’s past still lurk on and trouble its present. 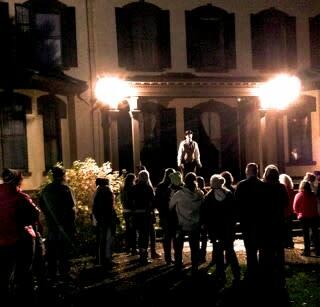 The path of this haunted tour begins in the Seward House grounds and winds its way to the gates of Fort Hill. The walk takes approximately an hour and is rain or shine. Tours depart from the Seward House Museum at 6:00 and 7:00 PM on October 21st- 22nd and October 27th- 30th. Admission is $12 for adults $8 for children (12 and under). Space is limited and reservations are strongly recommended. Call 315-252-1283 for more information and to book your place today! Jeff Ludwig is the Director of Education at the Seward House Museum. 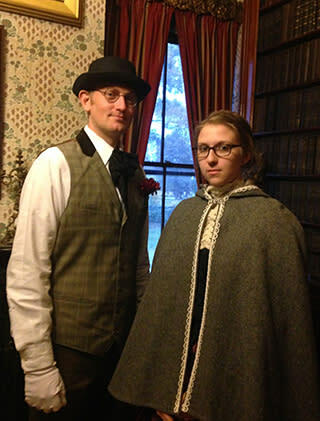 He is seen here in his Haunted History period piece attire alongside fellow Haunted guide Reilly Lagerhausen, the SHM Administrative & Visitor Engagement Coordinator.